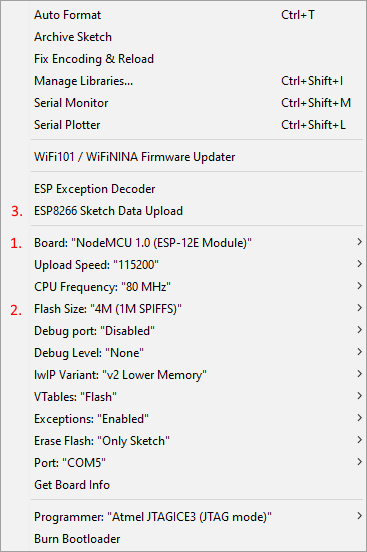 And i couldnt install spiffs correctly (and i had those error messagescause i dont have that 3rd option from the tutorial "ESP8266 Sketch Data Upload"
Tried to flash it while connecting to the pc, still couldnt go around this somehow. Someone seen something like this? Regarding the espcomm errors please make sure that your settings (port, board, frequency etc.) are correct. Heeyooo, and im back with same problems as kellogs, last problems were caused by the simply microusb cable, bought new one and it uploaded spfiis and sketch succesfully. 100% on both. # pragma message "FastLED version 3.002.001"
# pragma message "No hardware SPI pins defined. All SPI access will default to bitbanged output"
Error for adding content from tool! I've tried some simple LED projects and they worked OK so I dont know why this doesnt work? Do you have the same settings as mentioned in wiki? Than, there must be something... I'm testing it on NodeMCU and Wemos D1 mini and I have no problems with SPIFFS. Have you change anything compared to github? What eeprom libraries are you using? Had a look on that? Hmm.. got it working on my another pc, did evrything same... the page and led are working.. But, the system page where i put my led per corner and overall leds, it won't change it. I pressed save and it reloads the page, that's it. What shoud i do?